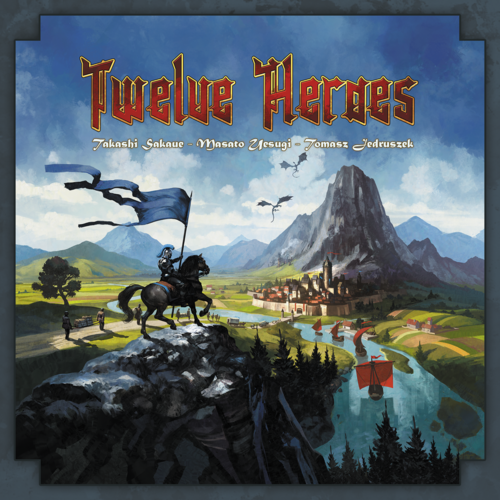 Twelve Heroes is another Japanese game being brought to a wider market by Catch Up Games at Essen SPIEL 2017. In this two-player only game, players compete over six territory tiles in a race to seven victory points. The game is set up with players sitting opposite. The six land tiles are shuffled together and placed face down in three piles of two tiles. The top card of each pile is then revealed. The playing area has the territory tiles in the center. The area just next to these land tiles is the play area. This is where Hero cards will be played to exert their influence over the land tiles. Closer to the player is the Camp area – “hired” heroes are kept here. 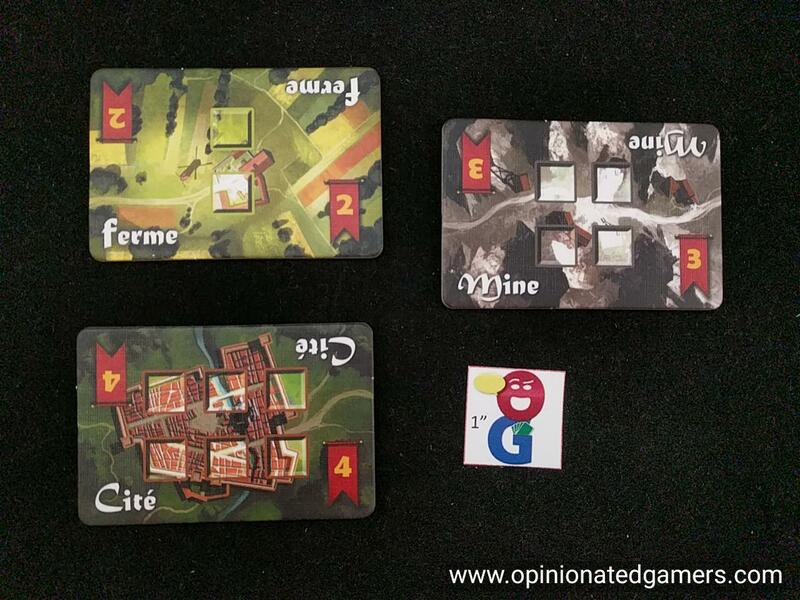 Each player starts with a deck to twelve Hero cards and seven control tokens in his color. There are 4 pre-built decks in the box, easily sorted by icon found on the card. However, the players can come up with whatever method they like to determine their starting decks (such as drafting). Each player shuffles their deck and draw an initial hand of three cards. The rest of the deck remains as a draw pile nearby. A start player is chosen somehow. Before the game starts in earnest, there is a round of deck management. Beginning with the starting player, each player can choose to place any number of initially dealt cards on the bottom of his draw pile and draw a matching number of cards from the top of his deck. Players take turns, going thru the 4 phases of each round until someone wins the game. The phases are: 1] Control; 2] Upkeep; 3] Income; 4] Military. 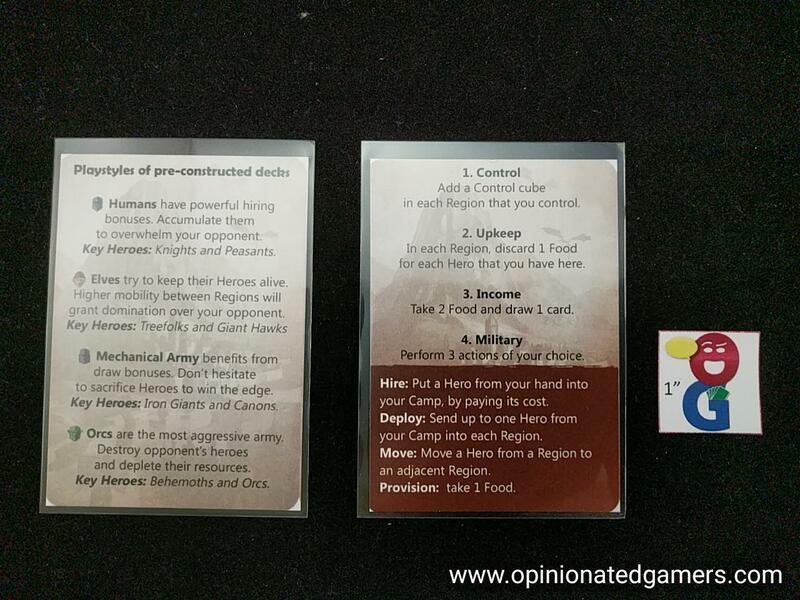 The very first round is an exception though – the first player starts with his Military phase, and then the opponent starts from Phase 1 of his turn. 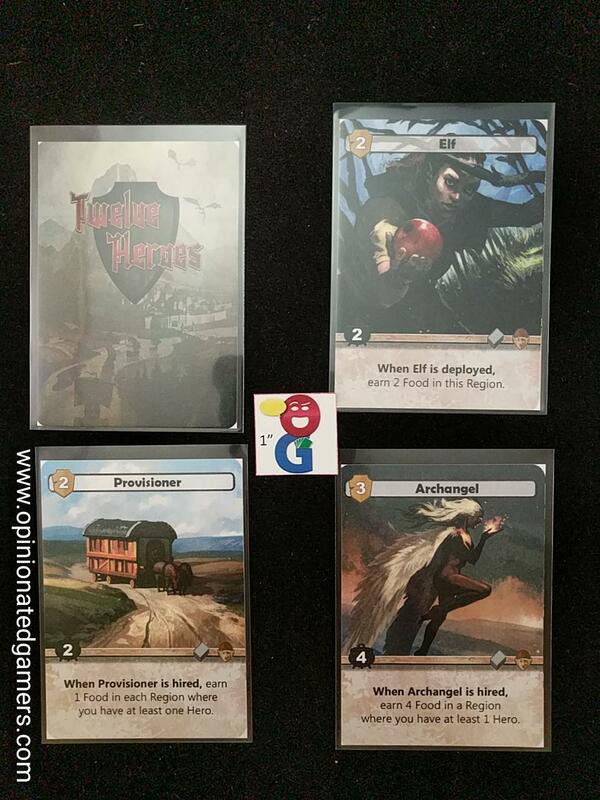 2] Upkeep – Each Hero card in your play area must be fed 1 Food token – taken from the Region where they stand. If you cannot feed all your Heroes, those that do not get Food are discarded. Note that you cannot use Food tokens from your Camp area; you can only use Food tokens that are at the particular land tile. 3] Income – Take 2 food from the supply and put it in your camp. Draw a card from your deck and add it to your hand. 4] Military – You get 3 actions to be taken from 4 possibilities – you can do the same action more than once. Move – Move a hero from one Region to an adjacent Region. The moving Hero can bring as much food as he wants to the new Region. If there is a “when moved’ action, it happens now. Once a player has gone through all four phases of his turn, there is a bit of upkeep. Players must discard their hands down to five cards. The game ends whenever any player has more than 7 points from collected land tiles. Thus far, I have been quite intrigued with this game. 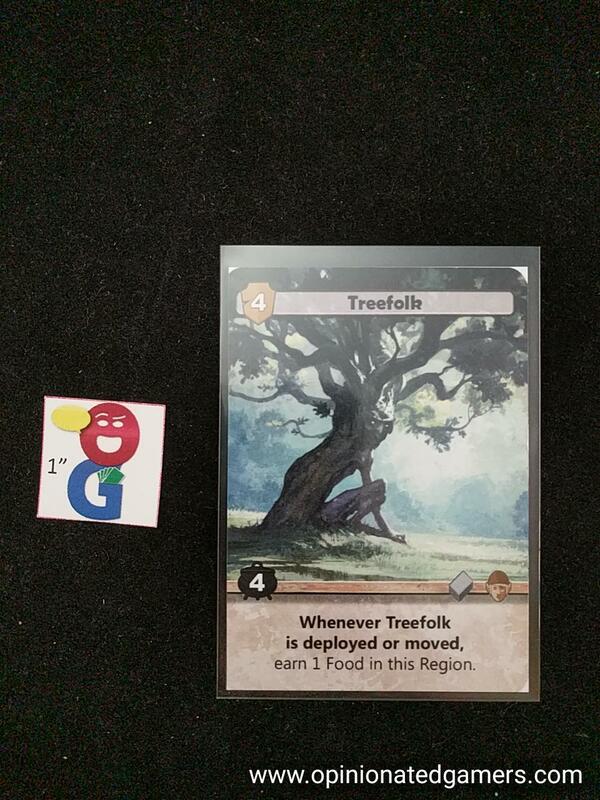 In our first game, we played with the pre-arranged decks (based on the icon on the card), and it was a tight game with a lot of back and forth action over the land tiles. I didn’t write down the scores, but it was pretty close – I think the final score was 7 to 5. About a week later, we played the game twice more using the recommended drafting technique – and the compositions of our decks were quite different, and we needed to employ all sorts of different strategies to best use the twelve cards in our deck. The actions are simple, and by the end of our first game, we were fairly proficient in the flow of the game. There is a nice tension here at each area trying to gain control of the card. First, you have to move the higher numbered cards into the area. But, then, once they are there, you have to constantly keep them fed or they will be discarded. This is harder than it seems as you end up having to move food around from other areas or from your camp. And, of course, if you are spending energy doing this, you are now taking efforts away from other land cards where your opponent is then surely gaining the upper hand. A lot of the special card actions (that trigger upon hiring) involve food generation and movement, but you can also get food to needed areas with the Deploy action – taking some of the stock from your camp… You need to watch how much you commit to a particular area as well – if you win the card, all of your heroes and food at this location are discarded! You could end up hamstringing your own efforts if you lose too many resources at a single card. The scoring amounts of the cards are 2, 2, 2, 3, 3 and 4 VP. Thus, most games will end up going to the player who first wins 3 cards – though it is possible to win with a 4 and a 3. However, the 2VP cards only need to be controlled for a single round, so they go quickly. Though I have just played three times, I have gotten a decent glimpse of the variety of strategies offered by the different twelve cards. Heck, I think the game might even be interesting if you just are dealt a random hand of twelve cards and you have to figure it out as you go. There isn’t much room in my collection for two player games, mostly because I don’t often play games with only 2p, but this one is so far entertaining enough (as well as physically small enough) to make the cut. This entry was posted in Essen 2017, First Impressions. Bookmark the permalink. That opinionated gamers 1″ tile inserted into every picture on this site has got to be one of the most annoying things in gaming for me! I think I just despise the logo so its painful to look at your pictures. You guys should reconsider some part of that.